Homebrew for Mac: Homebrew installs the stuff you need that Apple didn’t. Time goes fast! It was not a long time ago when I was listed in Virtualization and Cloud portal (vLaunchpad) and it’s my pleasure that I’m a candidate now. So, if you like this blog, please go and cast your vote here. Please remember that you should choose 10 items to proceed.You can also find winners for last year in vLaunchpad main page. HAProxy is a very good candidate for load balancing in a web cluster with high availability, even for Windows IIS servers! In its newer versions (1.5.x), HAProxy supports native SSL which makes it suitable for even enterprise level web applications with high traffic. It also supports sticky session which is useful when no session management is implemented. I know that the best option is to use centralized session management out of the box, but considering the fact that this central session manager will be point of failure (at least in IIS) and needs care, sticky session can be a good choice for some small to medium environments with short aged session applications. Here, I will show how to configure HAProxy 1.5.x to support backend IIS servers with SSL (https) and sticky sessions. – If you have IIS certificate, export it and use ‘openssl’ in Linux to convert it to appropriate format and put it in a protected directory. To have more information about different policies and different session behaviours, read here. There has been many discussions about the future of vCloud Director and if VMware intends to deprecate it. There is not much information from VMware about its vision but recently there is a great emphasis on vCloud Automation Center for cloud management that is now embedded in vRealize Suite. It seems a great product, especially for enterprises considering that it integrates management of different infrastructures (even physical and public cloud) into a single platform; but I still have some questions when I look at both vCloud Director and vCAC in regards to service providers who offer services to completely different, critical isolated organizations. I have read this blog post by VMware that explains VMware vision of Cloud management and transition plan, but still unsatisfied! By the way, it seems that sooner or later vCAC will be dominant solution for Cloud management and VMware will add features to satisfy different requirements rapidly. So, it’s a good time to get familiar with this product. I saw this post that is a very good practical introduction and hand out that explains and clarifies basic concepts in vCAC. There is also another simple, more detailed manual here. Of course, more information can be found in VMware documentation. p.s – From business perspective, it’s a smart move from VMware to focus more on enterprises rather than service providers because cloud service provider market is and will be dominated by other players. When it comes to networking, Linux kernel is really superior over Windows. Some will ask why? Apart from performance point of view, there are some great features in Linux that can not be deployed in Windows easily. To give an example, let’s think about 2 important features: support for VLAN and trunking (802.1q) and NIC teaming or Link aggregation (802.1ad). As far as I know, Windows kernel doesn’t support 802.1q and it all depends on NIC driver and for 802.1ad Windows support starts from Windows 2012 which means it’s too young! and who knows how it works! but both are prolonged features in Linux kernel. 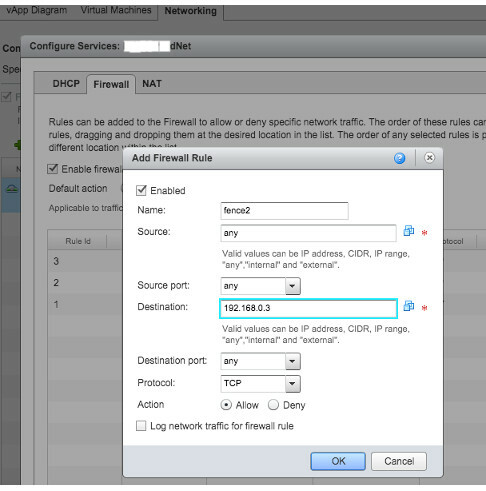 An interesting feature in vCloud Director networking is the capability of creating a fenced vApp. Basically, it’s like having an extra (in case you have one for Organization network which means routed) vShield router and firewall on the edge of vApp. One of the coolest applications for fenced vApps is when you want to have identical machines (same IP and MAC) in your vDC; it means when you want to do a fast clone without customizing guest OS by changing IP’s and names, … In this case vApps are completely isolated while they can have connection to External networks or perhaps internet! See here for a how-to about creating fenced vApp. Next step, you need to do NAT and open ports from Edge 1 to specific VM but this configuration is not in Edge Gateways of vDC (unlike Edge 2) but can be found in Networking Tab of the vApp itself. 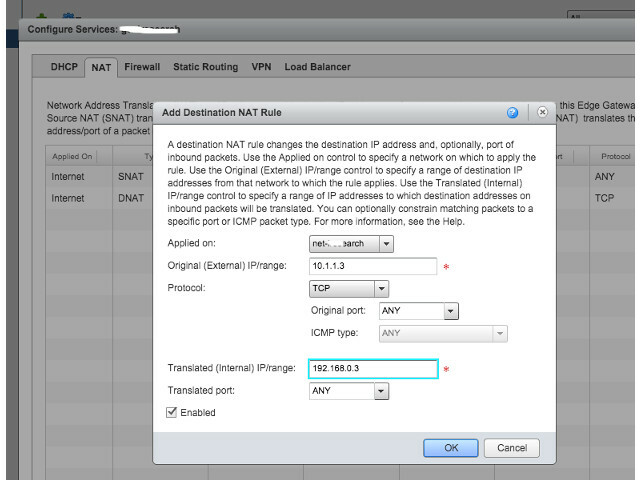 right click on the selected network and choose ‘Configure Services’. there, you can define appropriate NAT and firewall rules.